The Santa Fe River Watershed is 285 square miles – from Lake Peak (12,408’) in the Sangre de Cristo Mountains to the confluence with the Rio Grande at Cochiti (5,220’). 10% of this area (17,400 acres) lies above the City of Santa Fe, primarily within the Santa Fe National Forest. At Lake Peak, precipitation averages 35 inches/year; at Santa Fe 14 inches/year; at Cochiti 10 inches/year. The Santa Fe River is 46 miles long. The reach from Santa Fe Lake to Nichols Dam is roughly 10 miles. The Santa Fe River was first dammed in 1881. The Old Stone Dam filled with silt during a flash flood in the fall of 1904. It is now within the 188-acre Santa Fe Canyon Preserve, managed by The Nature Conservancy and open to the public (but not to dogs). An acre foot of water covers one acre (43,560 square feet) with water one foot deep. This equals 326,000 gallons. In 2003, the City of Santa Fe used 12,000 acre feet of water – 59% from wells and 41% from the river. In 2006, we used 9,300 acre feet – 78% from wells and 22% from the river. In 2007, we used 9,200 acre feet – 51% from wells and 49% from the river. In 1995, the City’s per capita water consumption was 168 gallons. In 2006, we used 37% less (106 per person)! 1,000 acre feet equates to a flow of about 1.5 cubic feet/second (cfs), or ten gallons/second, 365 days/year. The stream gauge below McClure Reservoir has recorded annual flows as exceptionally high as 19,000 acre feet (in 1919) and as low as 1,530 (1950). 1) Goldman, Don. 2003. The Santa Fe River and Its Water. The Nature Conservancy. 43 pp. 2) Grant, Paige. 2002. 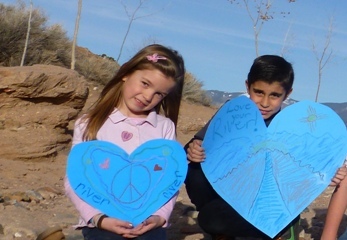 Santa Fe River Watershed Restoration Action Strategy (WRAS). 57 pp.